This product page is kept only for reference. For up-to-date information and new orders, please go to SQM4-ZY7. System-on-module with dual core microprocessor ZYNQ XC7Z020 from the SQM® modules serie. 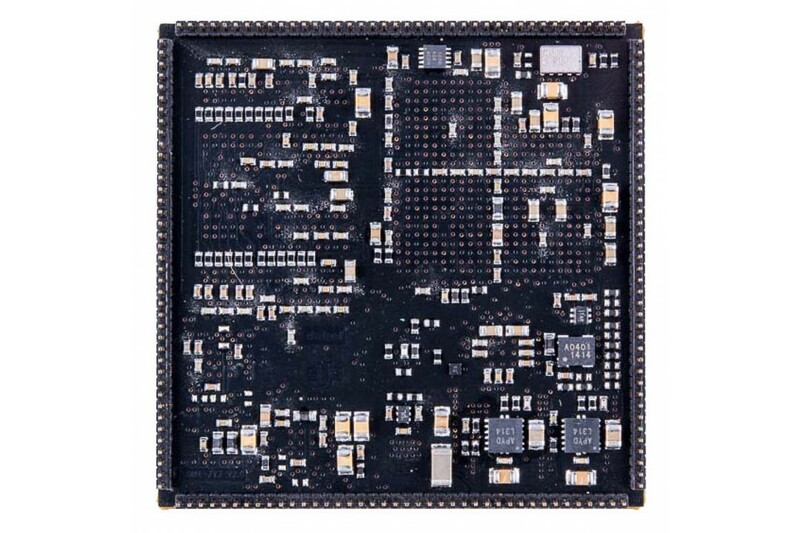 Besides the ARM Cortex A9 dual core microprocessor with 256kB of on chip dual port SRAM memory (OCM) accessible from PS and PL, it disposes of a 1 GB DDR3 SDRAM memory, 16 MB QSPI NOR FLASH memory, GBit and Fast Ethernet, USB and a wide range of other peripherals connectable via up to 141 GPIO. Quick and easy development is ensured by a JTAG connector. All this compressed on 16 cm2 only. SQM4-ZY7 is a solderable computer module based on the Xilinx Zynq ZC7020 - All Programmable SoC which combines Dual Core ARM Cortex A9 microprocessor and FPGA programmable logic. 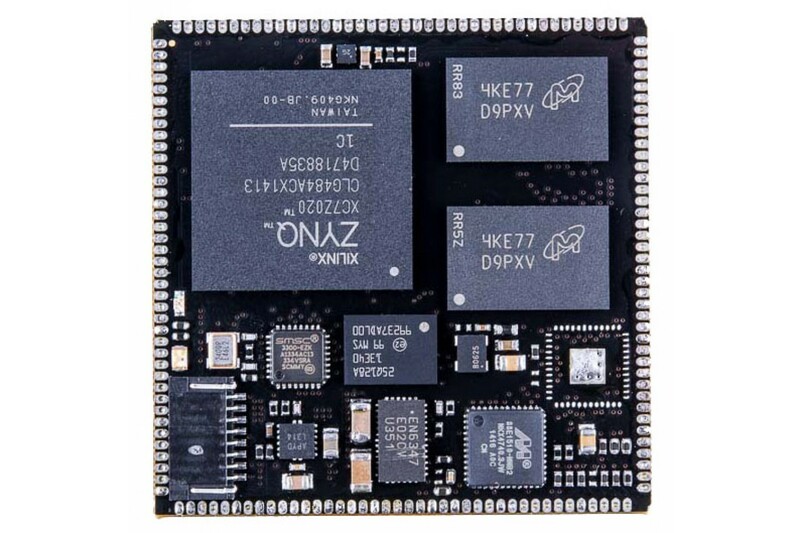 The SQM4-ZY7 module adds the key peripheral circuitry needed to successfully use the Zynq device in a high-performance applications. Unique SQM4-ZY7 layout and mechanics enables to minimize total application cost by concentrating most of the hard-to-route and timing-sensitive signals on the module board. This approach not only simplifies design and routing of the application board; it also enables faster prototyping and shortens the total development time. 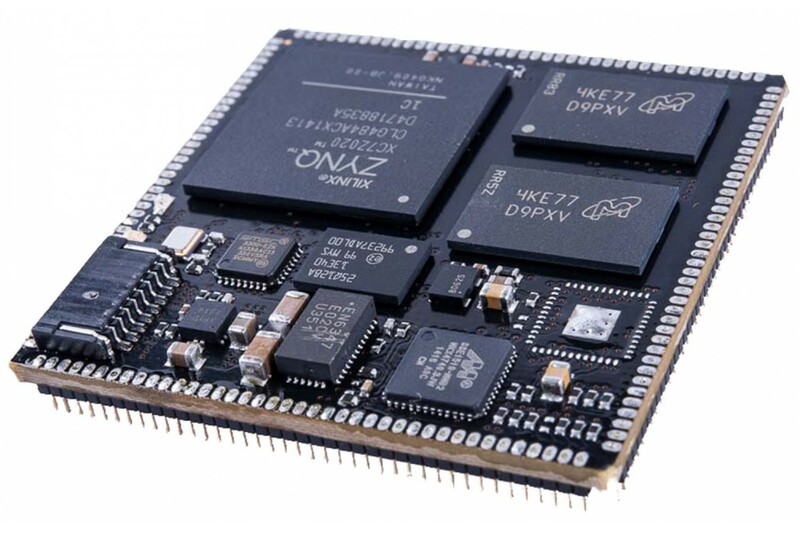 In addition to Zynq ZC7020 device, the module contains on board LPDDR3 memory, QSPI boot Flash, Gigabit network PTP-capable PHY with an option for 2nd Gigabit PHY, USB Host/Device PHY and RTC device. The module requires a single 5V/1A power supply input; additional required power levels are generated on board (3.3V, 1.8V, 1.35V and 1.0V levels). For complete list of ZC7020 SoC features, please visit www.xilinx.com. The module is placed on a thin ledge allowing the parts placement on both sides. Together with a high degree of integration it minimizes the module size, giving also an option to use the surface of motherboard for other (hidden) components. Rapid simplification of the motherboard circuits leads to usability of cheaper production technology and hence a significant price cut. The module is intended to be soldered directly on the board using the squared connection, providing 4 ways of assemblage - solderable pin, edge holes, RIM® or removable socket header connector. For a quick prototyping and evaluating the SQM4 modules, consider using of the EasyBoard development kit which can be ordered at EasyBoard, a development board expanding the most of the peripherals available on the module. The board itself illustrates how usage of SQM4 modules serie allows to produce full-fledged embedded device on simple two-layer board. The EasyBoard enables the SQM4 module to be connected to display, I2C-based accelerometers, I2S audio system, RS232 and CAN communication interfaces and more. SQM4-ZY7-PSchematic v20 New version with dual 1G Ethernet Phy, variable bank power, expandable USB and much more - short version 2015-02-11 19:19:33 To download this file you must be logged! SQM4_ZY7_v20_datasheet Datasheet of SQM4-ZY7 v20 module 2015-02-12 19:11:45 To download this file you must be logged! SQM4-ZY7-Schematic v20 New version with dual 1G Ethernet Phy, variable bank power, expandable USB and much more 2014-11-06 15:21:20 To download this file you must buy this product! SQM4-ZY7-intro Introduction and first project for SQM4-ZY7 with Xilinx VIVADO 2014-08-07 11:59:05 To download this file you must buy this product! SQM4-ZY7-training Folders and files for SQM4-ZY7 training with VIVADO 2014-08-07 12:21:02 To download this file you must buy this product! SQM4-ZY7-v2-demo Demo and testing apps for SQM4-ZY7-L and SQM4-ZY7-U modules with SQM4-EasyBoard carrier board. 2019-01-19 13:33:28 To download this file you must buy this product!